HausBar Farms: Imagine the Compostability! 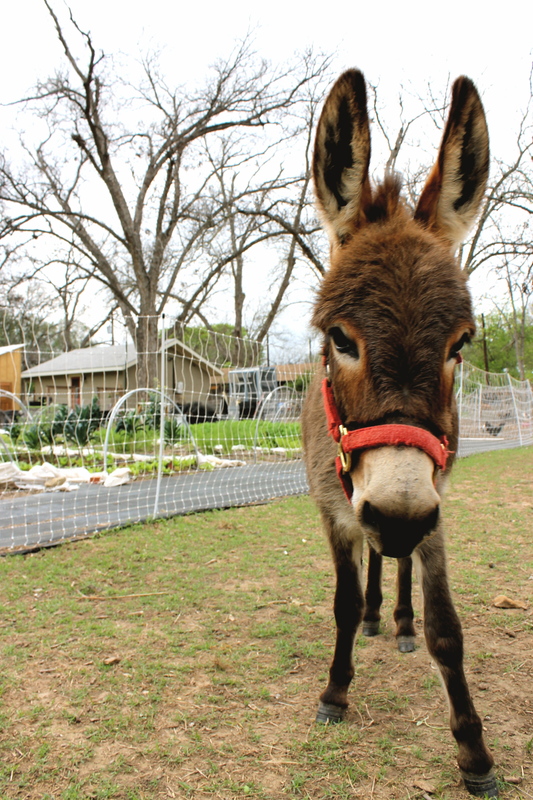 One of HausBar’s two donkeys stops grazing just long enough to pose for a picture in front of the hand-dug garden beds. No gas-powered tools are used on the farm, meaning each of the 51 garden beds was dug with pitchforks and shovels. What I’m looking at is black soldier fly compost, a method of composting that uses black solider fly larvae to breakdown matter that cannot be added to traditional compost, such as dairy and meat waste. When a black soldier fly detects a food source, she flies to the source and lays her eggs, which hatch on the food and start eating, eating, eating. When nature tells them it is time to become flies, they crawl out of a channel that is built into the compost bin and fall down a tube. At the end of the tube the insects are scooped up by chickens who are waiting for the tasty treat. “It’s almost a 100% conversion of protein,” she explains. “It’s really an amazing little life cycle.” I am touring HausBar Farms, an eco-conscious operation owned and run by Dorsey Barger, former co-owner of Austin’s Eastside Café, along with her partner Susan Hausmann. 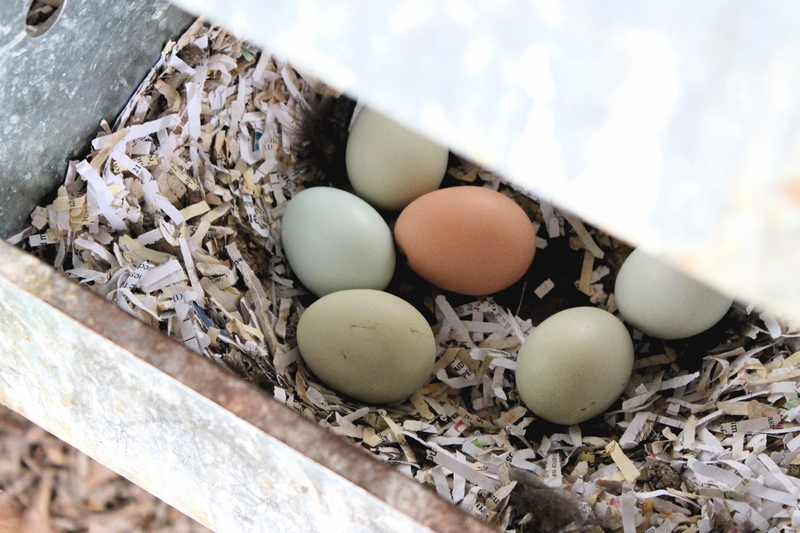 They supply eggs, chicken and vegetables to Austin restaurants and food artisans. It is a relatively new addition to the Eastside, but a welcome replacement to the crack houses that only a few years ago marred the now verdant 2 acre lot. And just as the landscape of her neighborhood has changed dramatically, so has the path of Barger’s life. But it is Barger’s passion for recycling that truly drives the way HausBar functions. Besides the black soldier fly composting used to handle the leftovers from the chicken butchery (of which there is not much! They use nearly every bit of the chickens–brains, eyes, gizzards, feet, etc. 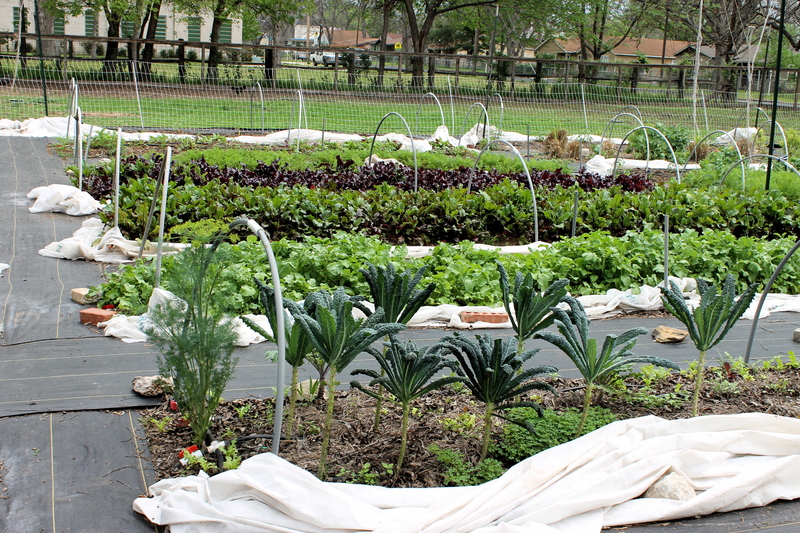 ), the farm uses three other methods that convert would-be waste into nitrogen and vitamin rich soil. The first method puts the chickens, donkeys, and lone goat to work. Mulch from a tree trimming company is spread out on the ground where the chickens and other animals like to peck around. 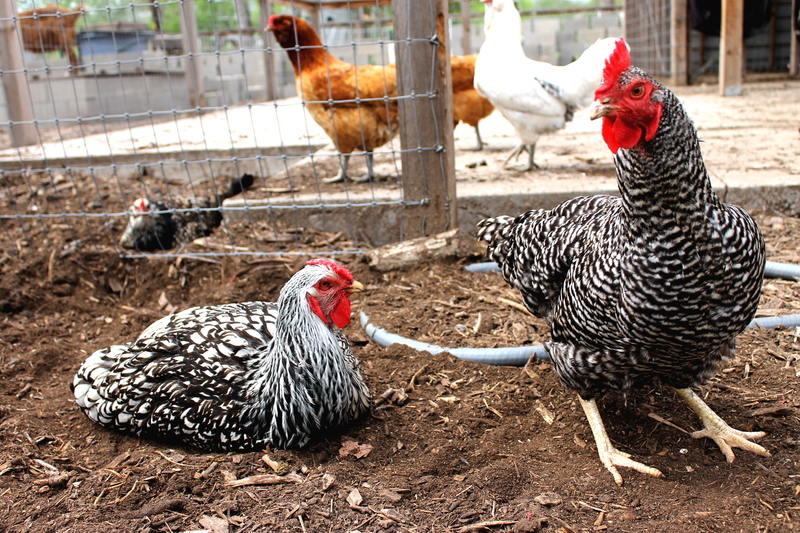 Between the scratching, eating, and pooping, the mulch is quickly turned to compost that is then put through a screener and used on the garden beds. The second method is vermicomposting, which uses worms–usually red wrigglers–to break down organic material into nutrient-rich worm castings. Barger keeps the worms and food scraps in an outdoor bin. When the worm castings are ready for use in the gardens, she places bananas in a corner of the bin, drawing the worms to migrate to that one area and leaving the rest of the bin clear for harvest. The last method is fairly common and requires very little to start up. 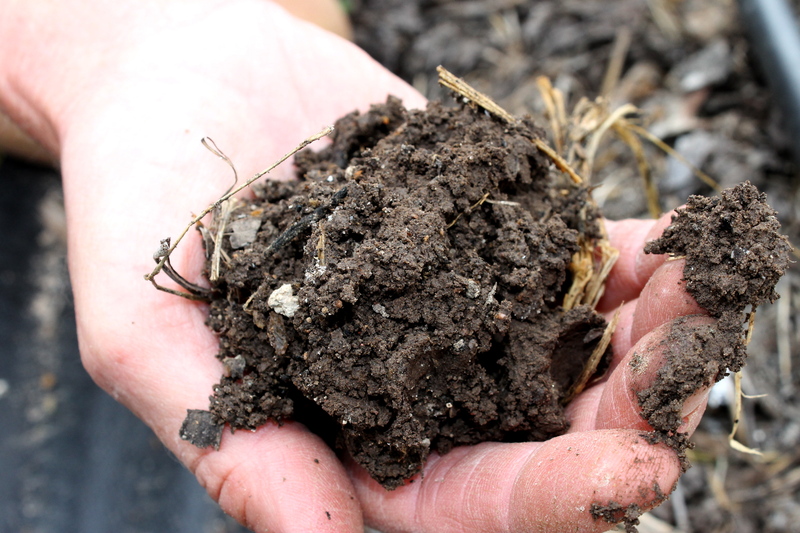 Thermophilic (heat) composting uses moisture and oxygen to fuel naturally occurring microbes that break down organic matter. It is the biological action of the microbes consuming the waste that heats up the compost pile, and all that is required to keep this heating and decomposition going is the occasional turning of the compost as well as the introduction of water. Barger is in constant exploration of new and more efficient ways of running her farm. She builds, experiments, tests, fiddles and makes things up on the spot. One of her successful undertakings is a mobile feed house that allows chickens–and only chickens–to wander freely in and out throughout the day with constant access to their food while keeping out curious donkeys and goats. 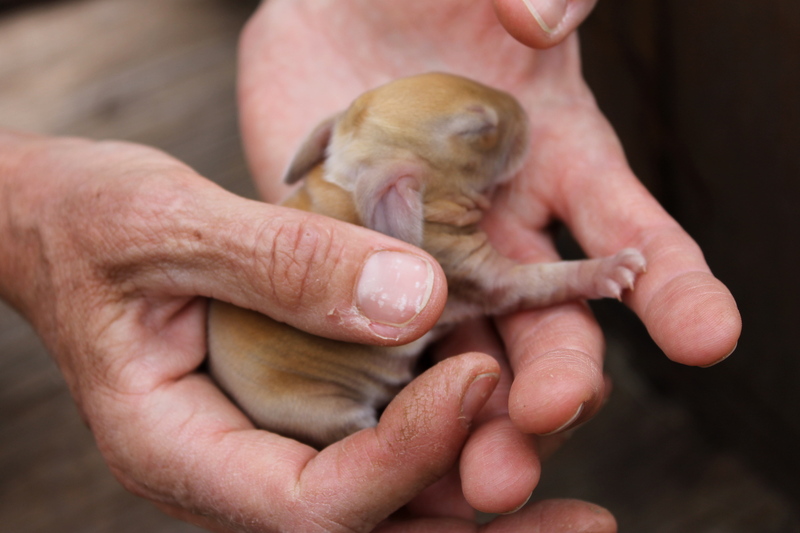 Right now she is experimenting with ways to raise rabbits outside of a cage, a trial made difficult by predatory hawks. After nearly two hours of guiding me through her farm, Barger says it is time to get back to work. It takes me a moment to regain my role as interviewer, as I have gladly fallen into the part of eager student and lost all sense of time. She extends an open invitation to return and explore further, and I gobble it up hungrily. Dorsey Barger has led me through an inspiring and educational day, the kind of day I hope to return to over and over. This entry was posted in Food Warrior Interns, On the Farm and tagged black soldier fly compost, compost, composting, food warriors, HausBar Farms, molly margulies, Real Time Farms, vermicompost. Bookmark the permalink.